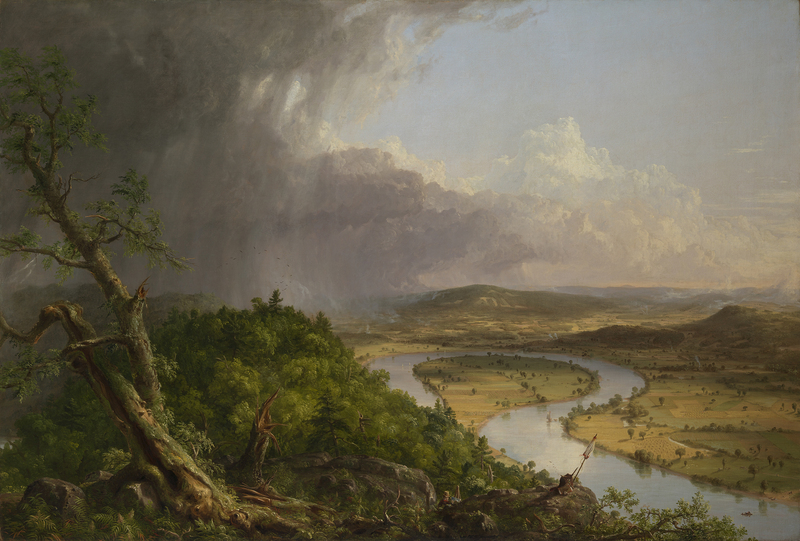 One of the highlights of teaching a survey of American Art is arriving at the point in the semester when the work by Thomas Cole (1801–1848), View from Mount Holyoke, Northampton, Massachusetts, after a Thunderstorm—The Oxbow (1836; fig. 1), appears on the screen. Cole, indeed, excites students. It is Cole’s sense of himself as a pedagogue that makes his work accessible and alluring. And it is the tireless promotion of his historical, religious, and artistic ideals that define the exhibition Thomas Cole: Eden to Empire, held first at the Metropolitan Museum of Art in New York (under the title Thomas Cole’s Journey: Atlantic Crossings), and then at the National Gallery, London. The London exhibition was comprised of fifty-eight works—organized by Elizabeth Mankin Kornhauser, Alice Pratt Brown Curator of American Paintings and Sculpture at the Metropolitan Museum of Art, and Tim Barringer, Paul Mellon Professor in the History of Art at Yale University, with Christopher Riopelle, The Neil Westreich Curator of Post-1800 Painting at the National Gallery—includes not only works by Cole but also a variety of works by artists such as John Constable (1776–1837) and Joseph Mallord William Turner (1775–1851), who influenced Cole’s oeuvre. The first section of the Cole exhibition, titled Industrial England, offers context for the world of factory production and industry that were integral to early nineteenth-century Britain and, by extension, Cole’s eventual disillusionment with the ways in which industry impacted America. Born in 1801 in Bolton-le-Moors, Lancashire, Cole witnessed the changes that industrialism wrought as factories expanded and the population grew. 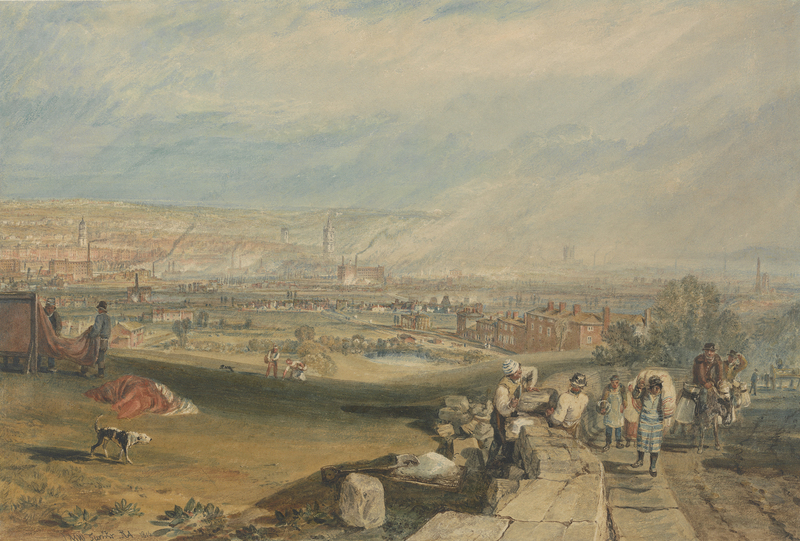 The initial room of the National Gallery exhibition includes Turner’s small watercolor of 1816 titled Leeds (fig. 2), representing the way in which factories, new forms of labor, and the destruction of the pastoral landscape could be found in a city that was only sixty miles from where Cole had lived when he was a boy. Cole’s father had a difficult time with this unanticipated economic reality; he had hoped to make money as a textile manufacturer, but he was not successful, and the Coles were never far from poverty. The Coles were not alone in their precarious position. Because of these difficulties, Britain became a hotbed of debate in reaction to this unceasing cycle of “progress,” as perhaps best exemplified by the rise of the Luddites. These infamous anti-technologists came to places like Bolton and destroyed machines and protested the spread of industry. The exhibition includes a hand-colored etching by an unknown artist, The Leader of the Luddites (1812; fig. 3). 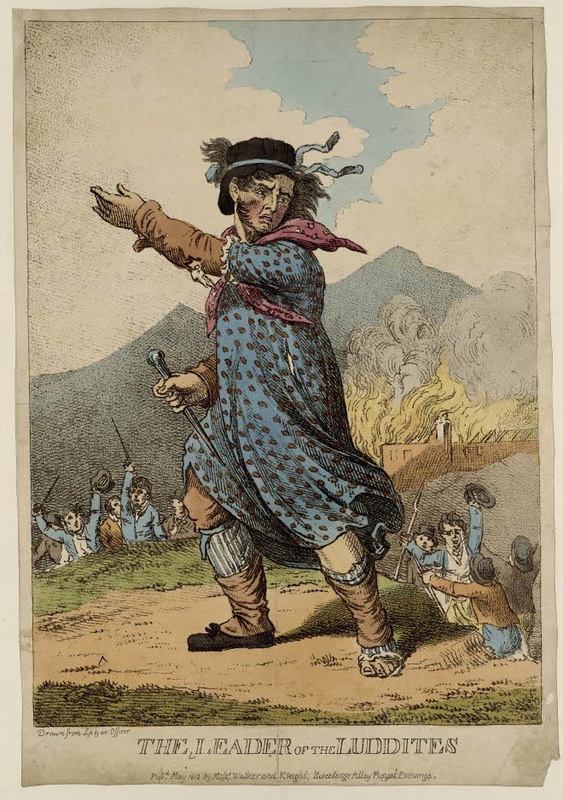 This image depicts a giant representation of Ned Ludd, the figurehead whose putative destruction of machines, known as knitting frames, made him a folkloric leader of the Luddites. Behind Ludd, a factory burns, and men raise their armed hands in protest. This etching, which Luddites circulated near Bolton in 1812, sets the tone for the remainder of the show. The Luddite project is a symbolic touchstone for the curators, who claim that Cole’s artistic protest against industrialization would rage for the remainder of his life. It was in America where Cole’s knowledge of influential European artists was formed, where he had moved in 1818 at a young age. For instance, the British artist John Martin (1789–1854), well known for his religious painting, was an important influence on Cole. In fact, Cole’s career in New York suffered after critics accused him of plagiarizing Martin’s work. Seeing Martin’s The Deluge (1834; Yale Center for British Art, New Haven), a 1828 mezzotint of which would have circulated in New York, in the same room as Cole’s The Garden of Eden of the same year, reveals close visual connections between the artists’ thematic choices and interest in Biblical subject matter. 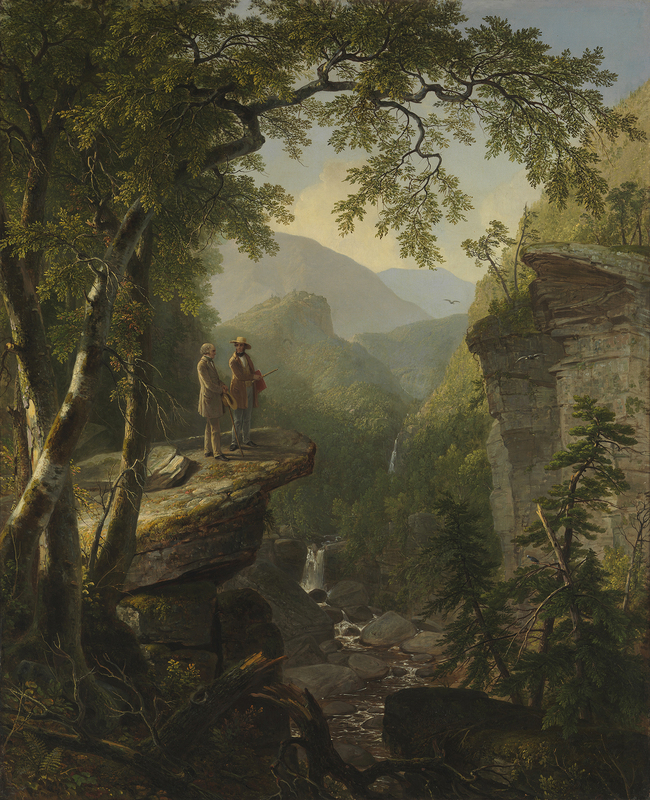 Other Cole paintings in the second section of the show, titled American Wilderness, especially his 1827 View of the Round-top in the Catskill Mountains (Sunny Morning on the Hudson) (fig. 4), highlight the artist’s passion for the mythical essence of the American Eden, in which misty clouds, blasted tree trunks, and an ominous perspective convey a raw and sublime sense of nature, devoid of human presence. 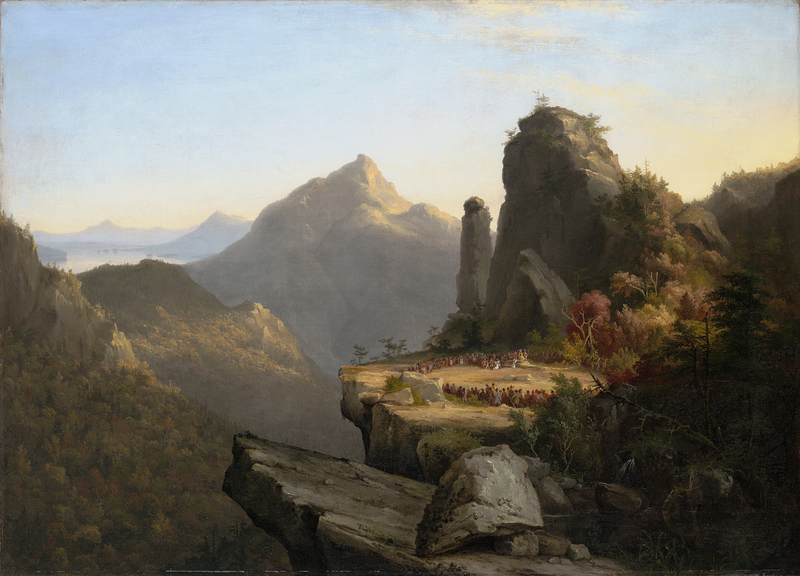 When he included figures in these works, Cole accentuated the history of the landscape before European conquest, as seen in his Scene from “The Last of the Mohicans,” Cora Kneeling at the Feet of Tamenund (1827; fig. 5). Turning to the popular writing of James Fenimore Cooper’s (1789–1851) second installment from his Leatherstocking series, Cole offers an elevated perspective related to a captivity scene, as a young white woman begs a chief of the Delaware for her own life as well as that of her half-sister. Beyond this interest in capturing Cooper’s narrative, Cole also devoted attention to the geological specifics that interested him, especially as they offered, from Cole’s perspective, evidence about the presence of the divine.2 Cole became intrigued with the idea that a Godly plan devised the awe-inspiring beauty found in the American landscape. He developed these ideas while studying the beliefs of the English Dissenters, a tradition that traced its roots to a break from the Church of England prior to the nineteenth century. While these early paintings of the wilderness offer a clear connection to European painters Cole admired, it was during his return to Europe in the late 1820s and early 1830s, when he spent time in England and Italy, that his fascination with European precedent became more pronounced. The third and fourth sections of the show, London and Italy, convincingly emphasize Cole’s obvious study of Turner, Claude Lorrain (1604/5–1682), and John Constable. Seeing Turner’s Snow Storm: Hannibal and His Army Crossing the Alps (exhibited 1812; fig. 6) in the same exhibition as Cole’s The Oxbow (1836; fig. 1) makes it evident that the time Cole spent in Turner’s well-respected private gallery in 1829 created an obvious impression, in terms of the raw power of nature that Turner captured as well as Turner’s interest in using landscape to impart a specific historical message. Other Turner paintings, such as his Ulysses Deriding Polyphemus—Homer’s Odyssey (1829; National Gallery, London), moved Cole to sketch what the exhibition catalogue argues was the American artist’s “first chance . . . to see landscape painting of such ambition and originality.”3 But it was the time in Italy, starting in 1831, that solidified Cole’s professional trajectory, as he embarked on the Grand Tour, taking in the ruins and historic aspects of the European landscape. Again, in keeping with the transatlantic theme of the exhibition, it is clear that Turner’s images of Italy (think of Turner’s Florence from the Chiesa al Monte, c. 1818; private collection) influenced Cole’s representations of Italy. However, it is the desolate and visually evocative ruins found in Cole’s paintings, such as his Interior of the Colosseum, Rome (c. 1832; Albany Institute of History and Art, New York) and Aqueduct Near Rome (1832; fig. 7), that explain how these haunting landscapes from the ancient world began to inform his artistic vision regarding the arc of empire and history. It is in the fifth section of this exhibition, which focuses on the five-part cycle The Course of Empire (1833–36; New-York Historical Society, New York), where the curators home in on their central argument about Cole’s disillusionment with the American political scene and its concomitant disregard for what had been an Edenic landscape. After returning to the United States in November of 1832, Cole received a commission from New York entrepreneur Luman Reed (1787–1836) to complete these five works. The wall text for this section notes, “The Course of Empire is a moral fable in which progress and civilization are undermined by man’s greed and innate aggression. Human progress is inevitably self-destructive, and the natural world eventually prevails. Cole was issuing a clear warning to modern America.” The Course of Empire offers a lucid narrative, as our eyes move through the cycle, watching the rise and fall of civilization from a nineteenth-century perspective. Cole grounds our sight with a rock formation that stays consistent in each composition, but the figures and visual tropes change. The population goes from uncivilized to idyllic to sybaritic to decimated to vanished in five spectacular beats. The wall text for each of the five paintings, which include The Savage State, The Arcadian or Pastoral State, The Consummation of Empire (fig. 8), Destruction (fig. 9), and Desolation, furthers the contention that Cole abhorred the direction of American civilization and used these paintings as a didactic tale about unchecked progress and Jacksonian expansion. As the wall text for Destruction contends, “As a result of its own moral failings, the empire is falling. 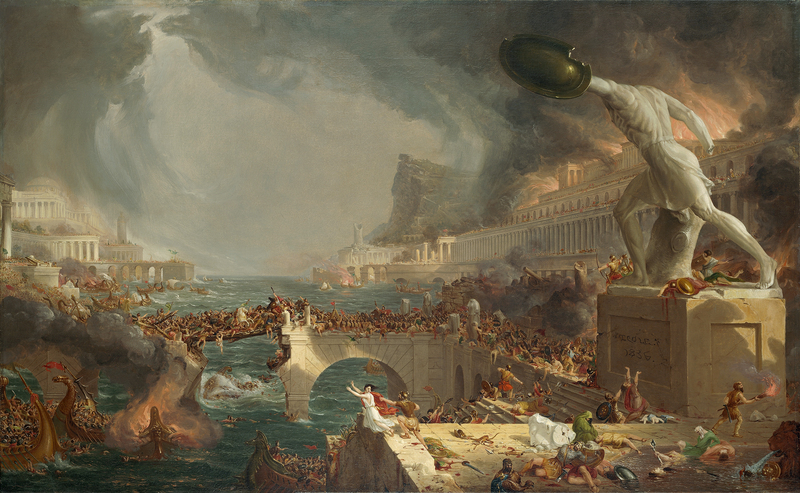 Beneath an enormous Roman gladiator, the innocent are being butchered, and the achievements of civilisation destroyed.” Cole renders the violence that led to the ruins he celebrated in his Italian paintings of the early 1830s. By placing this section of the exhibition after the Italy portion, the curators help the visitor make visual connections between actual ruins and Cole’s contention about the cycle of history. Even though Cole’s language is direct, there are other scholarly ideas about Cole’s representations that do not always support the artist’s supposed pessimism. In a recent issue of the journal American Art, David Peters Corbett contends, in an article that focuses on George Caleb Bingham, that Cole’s The Oxbow “provides the painting’s audience with an image of aspiration toward a developed and transmuted landscape, in which ‘wilderness’ becomes settled and ordered ‘civilization.’”5 Corbett’s theory about “futurity,” or what he sees as Cole’s embrace of the landscape’s future that is before his viewer and himself (remember he places himself in the image), posits another perspective about the artist’s oeuvre that Eden to Empire does not consider. Some discussion of other possible readings of these potentially ambiguous landscapes would have been a welcome addition to this exhibition. 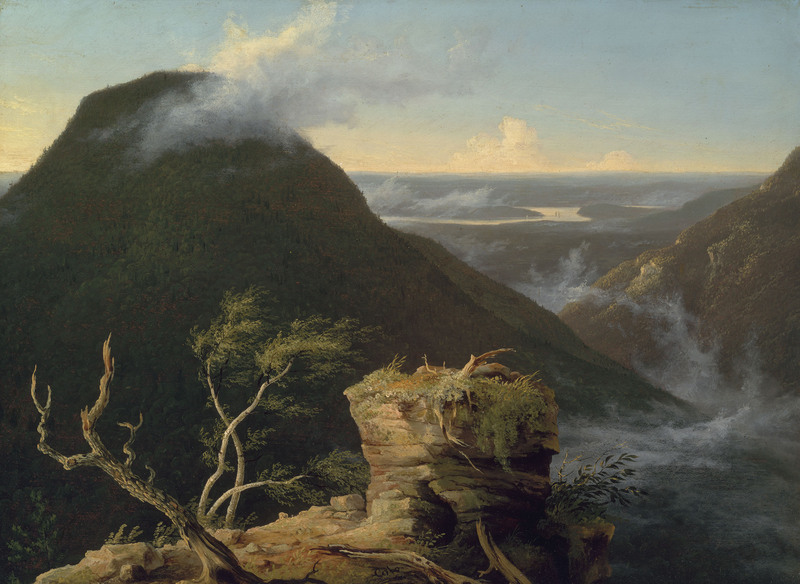 The final gallery is Cole’s Legacy, which emphasizes the landscapes of Asher B. Durand (1796–1886) and Frederic Church (1826–1900) that pay homage to Cole. The curatorial text that opens this seventh section explains, “Artists increasingly championed the theory that nationalist expansion was a God-given right—the very antithesis of Cole’s beliefs.” While works such as Durand’s Kindred Spirits (1849; fig. 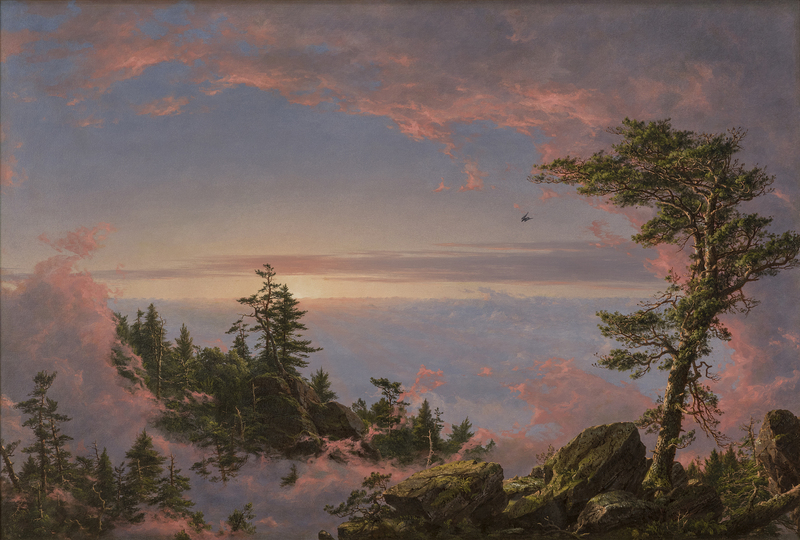 10) and Church’s Above the Clouds at Sunrise (1849; fig. 11) clearly reference Cole, either by placing him in the work, which Durand does, or by including a cross in a landscape that metaphorically references Cole’s passing, as in Church’s painting, it is the inclusion of less celebrated artists that makes this section stand out. It was especially enlightening to learn about Thomas Charles Farrer’s (1839–1891) View of Northampton from the Dome of the Hospital (1865; Smith College Museum of Art, Northampton, MA), which returns us to the site of Cole’s The Oxbow yet stylistically departs from Cole by including exacting details of nature in a manner more akin to the American Pre-Raphaelite movement Farrer founded. Moreover, there is a more celebratory tone of progress in these works by Cole’s followers, who do not seem as intent on questioning progress. Yet beyond the nineteenth century, the National Gallery pushes Cole’s legacy into the realm of the contemporary in a location the museum calls “Room 1,” a space some distance from the Cole show, yet right next to the Trafalgar Square entrance to the museum. Here visitors can view the Edward Ruscha (b. 1937) exhibition, Ed Ruscha: Course of Empire, an artistic and curatorial response to the Cole exhibition. Room 1 includes ten paintings by Ruscha, five black-and-white works from 1992 and five colorful paintings from 2003 and later of the same sites represented in the black-and-white canvases. In 2005, Ruscha exhibited this series at the Venice Biennale with the Cole-influenced title Course of Empire. Like many of his works, Ruscha’s Course of Empire represents Los Angeles in a cool, distant, and yet documentary-like fashion. In the black-and-white paintings, he renders industrial sites, including four geometrically rigid buildings and one telephone booth. The later paintings are of the same locations, but, over the course of a decade or more, the structures have changed. Either the architecture has been transformed, as is the case with Blue Collar Tires (1992; fig. 12) and Expansion of the Old Tires Building (2005; fig. 13), or it has become absent, as is the case with Blue Collar Telephone (1992; Museumsstiftung Post und Telekommunikation, Bonn, Germany) and Site of a Former Telephone Booth (2005; Collection of Joan and Irwin Jacobs)—or the writing on the building signals a change in ownership, as is the case with Blue Collar Tool & Die (1992; fig. 14) and The Old Tool & Die Building (2004; fig. 15). Each painting is quite large and rectangular; the smallest is 52 by 116 inches in length, making their impact similar to Cole’s large canvases. 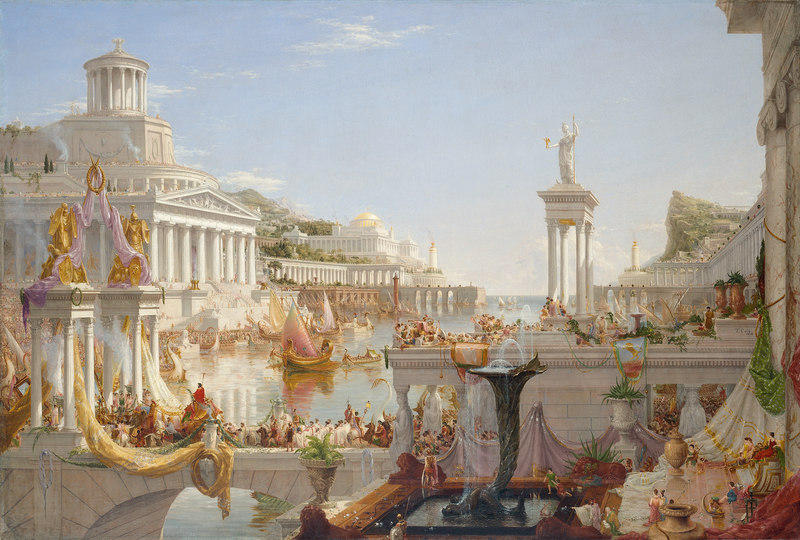 Cite this article: David Brody, review of Thomas Cole: Eden to Empire and Ed Ruscha: Course of Empire, National Gallery, London, Panorama: Journal of the Association of Historians of American Art 4, no. 2 (Fall 2018), https://doi.org/10.24926/24716839.1674. Please click here for an interview with the curators Elizabeth Mankin Kornhauser and Tim Barringer, conducted by William L. Coleman.